The Evan Williams Bourbon Experience is the first of several ventures to bolster tourism and bring small-batch bourbon production to the heart of downtown Louisville. The maker of Evan Williams bourbon has uncorked a new attraction, opening a craft distillery just steps from where the whiskey pioneer who inspired the brand fired up his own commercial stills two centuries ago. The distillery and “bourbon experience” – complete with tours and tasting rooms – is the first of several ventures to bolster tourism and bring small-batch bourbon production to the heart of downtown Louisville, once the hub of commerce for Kentucky whiskey makers. Today’s powerhouse bourbon brands such as Jim Beam, Wild Turkey and Maker’s Mark are crafted in rural Kentucky settings, an hour or less away, but the trade is showing signs of a comeback in the city. An urban bourbon trail features 27 bars and restaurants, each stocked with at least 50 labels, and a planned bourbon district would tie together the city’s bourbon heritage with historical markers and landmarks in the Whiskey Row area, where clusters of whiskey merchants, wholesalers and blenders set up shop decades ago. Heaven Hill, which makes Evan Williams, is at the forefront with its new $10.5 million attraction – The Evan Williams Bourbon Experience. It’s located in a renovated building and offers tours that trace bourbon production from frontier days when whiskey was currency to its contemporary revival in bars and restaurants across the globe. It features a five-story Evan Williams bottle replica and of course, it has a gift shop, too. It opened to the public Friday. Kentucky produces 95 percent of the world’s bourbon, and the 4.9 million barrels of aging bourbon in this state outnumber the population here, according to the Kentucky Distillers’ Association. As demand worldwide has spiked, the state’s bourbon production has risen more than 120 percent since 1999 to more than 1 million barrels in 2012, the industry group said. More than 2.5 million visitors have toured the major distilleries along the Kentucky Bourbon Trail in the past five years, the group said. Heaven Hill’s attraction, located on Whiskey Row, will be the northern gateway to the trail. Despite its bourbon prowess, the Bluegrass state hasn’t kept pace with other parts of the country in attracting upstart craft distillers. Kentucky ranks eighth nationally in distilled spirits permits, said Kentucky Distillers’ Association President Eric Gregory, citing federal statistics. California ranks first, followed by Washington state, New York and Oregon. Kentucky’s tax on aging whiskey barrels has been an obstacle, he said. Still, he’s working with 10 craft distillers setting up shop in Kentucky. “The next craft distiller, in 20, 30 or 40 years, could be the next Maker’s Mark,” Gregory said. At The Evan Williams Experience, the star is Williams himself, a Welsh immigrant and early commercial distiller in Kentucky who started in 1783. During a tour of the distillery, projections on the walls and TVs delve into bourbon making and detail Williams’ life as a city trustee, wharf master and distiller as the aroma of fermenting whiskey and aging barrels waft by. “This is where the industry really started,” said Max L. Shapira, president of Heaven Hill. Its flagship Evan Williams brand is the second-largest selling bourbon in the U.S. and the world, behind Jim Beam. At the downtown distillery, whiskey makers will craft special recipes and produce one barrel per day, a drop in the barrel compared to the company’s distillery a few miles away that churns out some 650 barrels daily. Several other whiskey makers are planning craft distilleries nearby. Bourbon entrepreneur Corky Taylor is reviving his great-grandfather’s company, Kentucky Peerless Distilling, and hopes to start producing bourbon and moonshine in July. His line of spirits will include a premium bourbon, aged eight years, named after his great-grandfather, Henry Kraver, who ran a distillery in western Kentucky nearly a century ago. The makers of Angel’s Envy whiskeys are hoping to start production in a little more than a year at a new downtown distillery, adding a twist to its bourbon and rye whiskey production, said Wes Henderson, chief operating officer for Louisville Distilling Co.
After aging its bourbon in white oak barrels for several years, the product will be finished in port casks for several more months. Its rye whiskey ages for years in oak barrels before finishing in rum casks. 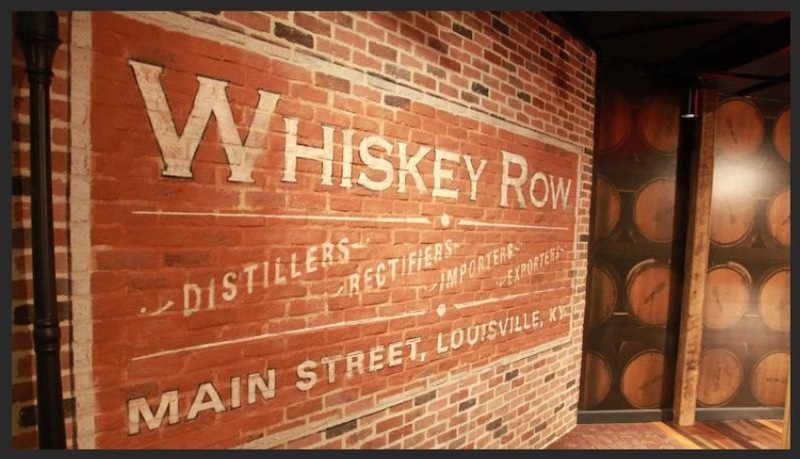 The post The Whiskey Row Revival appeared first on The Bourbon Review.